The DSM-40DC-E Gigabit Console Server delivers secure in-band or out-of-band access to 40 RS232 serial console/maintenance ports on your switches, routers, firewalls or other mission critical devices. The DSM provides around the clock access to remote networks, eliminating expensive and untimely truck rolls. When the network is down and you need to quickly and securely access failed equipment to bring it back online, an out-of-band solution with primary and secondary gigabit ethernet ports is a must. 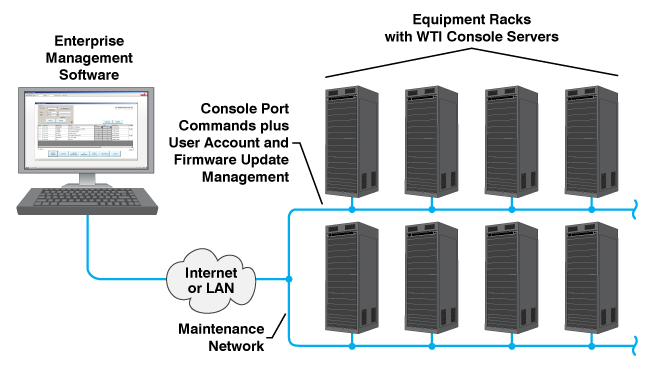 The DSM-40DC-E includes dual 10/100/1000 ethernet ports with full fallback capabilities. This helps to assure that even if your primary network is not available, you can still access the DSM-40DC-E via secondary network in order to communicate with serial ports on remote devices. When communication via the primary network is interrupted, fallback capabilities enable the DSM-40DC-E to automatically switch over to the secondary network, providing dependable access to remote ports when needed the most. The DSM-40DC-E can remotely monitor network devices, including WTI power switches, constantly watching for significant changes. Administrators are promptly notified via SNMP or email when high temperature, full port buffers, invalid access attempts, communication loss to network equipment or other critical events are detected. Secure SSHv2 encryption, HTTPS/SSL secure web, port-specific password protection, IP packet filtering and other security features allow the DSM-40DC-E to be used in the most secure environments. The DSM-40DC-E allows administrators to use managed MIB objects to edit subscriber accounts, set configuration parameters and display unit status. In addition to these MIB based management and control features, SNMP Traps can provide notification when alarm events are detected. The DSM-40DC-E allows outbound SSH and Telnet connections to be initiated from a free RS232 serial port. Providing that outbound SSH/Telnet is enabled for the individual subscriber, this provides users and administrators with the ability to connect to other network devices via TCP/IP. 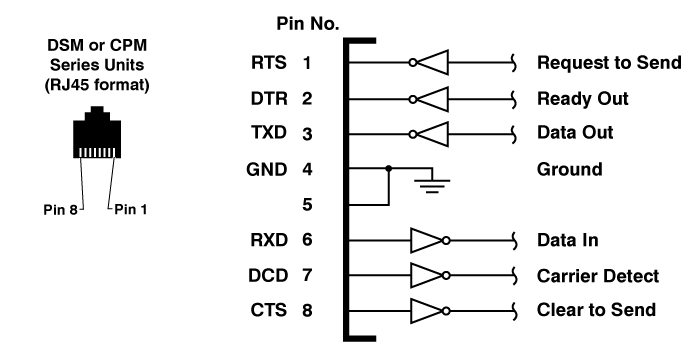 When enabled, the DSM-40DC-E will ping IP addresses or domains, specified by the administrator,according to a set schedule. If the device at that IP address or domain fails to respond, then the Ping-No-Answer alarm can provide notification via Email, Syslog Message or SNMP Trap. The DSM-40DC-E can provide prompt notification via Email, Syslog Message or SNMP trap when serial communication with an attached WTI device is disrupted. The attached WTI device must have the'Heartbeat' feature enabled. Secure Shell (SSHv2) encryption and address-specific IP security masks prevent unauthorized access to command and configuration functions. The DSM-40DC-E also provides four different levels of user security; the Administrator, Supervisor, User and View Only level. The Administrator level, which is intended for use by system managers and other administrators, provides complete access to all port connection / disconnection functions, operating features and configuration menus, and also allows access to any port on the switch. The User level is ideal for co-location applications, since users are only permitted to view status and connect to the ports allowed by their user name and password. DUO is a cloud based two factor authentication (2FA) service that corroborates the identity of each logon to ensure that users are actually who they claim to be. When a user enters an account name and password to logon to the DSM, DUO then re-authenticates the user’s identity via mobile phone or other device. This effectively shifts access protection from a perimeter based approach that relies on the privacy of the user’s logon credentials, to an application based security solution that requires additional interaction from the user before access is granted. In order to help simplify configuration and setup of SSL communication, DSM Series Products now support Subject Alternative Names (SAN). SAN is an extension to SSL X.509, that allows a selection of additional host names (DNS names, IP Addresses, Email Address and URIs,) to be protected by a single SSL Certificate. Subject Alternative Names allow you to perform virtual hosting of multiple SSL sites on a single IP address and eliminate the hassles involved in configuring multiple IP addresses on your server. Zero-Touch Provisioning (ZTP) simplifies day 0 onboarding of DSM units and in many cases, eliminates the need to have an engineer present during initial set up. If configuration information is not detected during boot up, Zero-Touch Provisioning will be activated and the device will contact a DHCP server and then download a configuration script and perform a firmware update without user intervention. This drastically reduces service interruptions due to human error and cuts the time required to set up newly installed DSM Series products. Each RS232 serial port of the DSM-40DC-E can be individually accessed by number, name, or group via SSH or Telnet sessions. The DSM-40DC-E also allows direct connections using TCP port assignments. Each serial port can be separately configured using simple menu driven commands to set the port password,data rates, flow control and other operating parameters. The full matrix capability of the DSM-40DC-E allows you to easily connect any two ports on the switch, even when the ports are using different communications settings. Ports can also be connected or disconnected by a third party with supervisor rights, and system managers can swap various RS232 devices between ports at a remote location. "Buffer Mode" allows individual ports to capture and store incoming data, such as error and status messages received from attached console ports. This "snapshot" of the last data received is stored in memory, and can be viewed, saved or erased by the system operator at any time. Console messages can be stored in the DSM-40DC-E port buffers, and sent to a remote location via SYSLOG, or an SNMP message can be generated to alert administrators when new console messages are received. All WTI console server products include WTI’s convenient Enterprise Management Software, which drastically simplifies the task of managing multiple console servers spread throughout your network infrastructure. The WMU Enterprise Management Software provides a centralized command interface that allows administrators to easily manage, label and control multiple WTI console servers in large network applications, reducing the time required to access console port command functions on connected devices. Once installed on your PC or laptop, the Enterprise Management Software can search a user-defined IP address range on your network and discover all WTI console servers within the range. Discovered units are then added to the Enterprise Management Software’s inventory, allowing administrators to assign a descriptive tag to each console server in order to denote the location or function of the device. In addition to providing a centralized interface for remote console port access, the Enterprise Management Software can also be used to control firmware updates for WTI products and edit and manage user accounts at individual or multiple WTI console servers. Voltage: -48V DC, 0.3 Amps Max. The DX9M-RJ Adapter Kit is specifically pinned to allow you to use the DB9 cables that are already installed in your data center with our RJ45 serial console servers, effectively converting RJ45 ports for use with existing DB9 cables.